Delicious bacon wrapped chicken breast. The bacon adds a delightfully smoky flavor, and keeps the chicken breast extra juicy! You have to make this bacon wrapped chicken breast! It’s amazing! I’m not usually a fan of boneless, skinless chicken breasts. The darling of low-fat diets, I find that they are often bland, too dry and – obviously – not fatty enough. I did finally learn how to bake chicken breast, keeping it juicy. And this recipe for skillet fried, then baked skin on chicken breast is amazing. Bacon wrapped chicken breast elevates this humble dish into a whole new level. 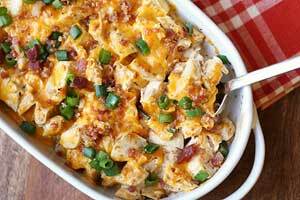 The bacon adds a delightfully smoky flavor and also keeps the chicken breast extra juicy. The honey-mustard sauce finishes the dish, creating a delicacy out of the simplest of ingredients. This recipe was written for small chicken breasts, 6-7 oz. If you use large chicken breasts, 10-12 oz, use just two chicken breasts for 4 people and wrap each of them with 4 strips of bacon. You will need to bake them for longer – probably 25-30 minutes, so cover them loosely with foil after the first 20 minutes to avoid scorching the bacon. What to serve with bacon wrapped chicken breast? Anything, really. It’s a very versatile dish. It does go nicely with mildly sweet sides. So I often serve it with roasted carrots, with microwave sweet potato, or with mashed pumpkin. But is this dish healthy? Isn’t bacon really bad for you? Bacon, even uncured grass-fed bacon, isn’t as healthy as fresh meat. That’s true. I wouldn’t advise anyone to eat entire packages of bacon or to base their meals around it. 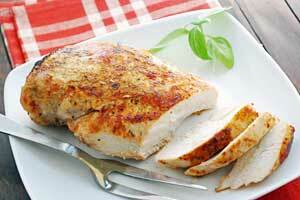 Sprinkle both sides of the chicken breasts with salt, pepper and garlic powder. Wrap each chicken breast with 2 strips of bacon. Place the wrapped chicken breasts on the prepared roasting rack. Brush them with half the mustard-honey sauce. Wash the basting brush with warm soapy water and keep the other half of the sauce for brushing the chicken breasts when they finish cooking. Bake the chicken breasts for 15-20 minutes, until they reach an internal temperature of 160-165 degrees F and the bacon is browned and crispy. Allow the chicken breasts to rest, loosely covered with foil, about 10 minutes, then brush the tops with the remaining sauce and serve. The low carb version has zero grams of carbohydrates.